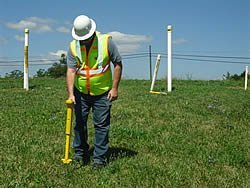 Are you responsible for gas transmission pipelines, distribution services or for identifying other underground utilities? Schonstedt offers both magnetic locators and pipe and cable locators to fit every need in the gas and oil industry. Magnetic Locators for gas and oil applications detect valve or curb boxes, shut-off valves and iron pipe joints up to 18′ deep. Magnetic locators react to the outline of a ferrous metal object to pinpoint its location with precision. Pipe & Cable Locators detect the path and depth of metal gas pipelines and distribution services. Pipe and cable locators also detect tracer wire or detectable metal tape (aka mule tape) buried alongside polyethylene (PE) pipe at a maximum depth of 20 feet. The Schonstedt XTpc-82 works best for quick, short distance locates with less congestion. The Rex Multi-Frequency Locator is best in more congested areas as well as for large scale projects demanding the ability to change transmitter frequency or power settings for better accuracy. Both models can detect a pipeline or wire by means of conductive (direct connect) and inductive (indirect) mode. Also available with passive cathodic. Magnetic and Pipe & Cable Locator Kits, MPC kits combine the best of both worlds while saving time & effort — all in one convenient hard-case for limited storage situations. Comprising an utility locator and a magnetic locator, these kits detect and locate all objects described above in Magnetic and Pipe & Cable applications as well as all 512 Hz transmitted sources. The MPC-Rex Combo Kit is truly the one kit that finds it all, designed for utility locating professionals in Water, Sewer, Gas, Electric and Telecom industries. The Kit includes a GA-92XTd Magnetic Locator and a Rex Multi-Frequency Pipe & Cable Locator and accessories. The entire system fits easily into a custom shoulder bag. The MPC-800 kit comes with a single-frequency XTpc Pipe & Cable Locator (82 kHz) and a GA-92XTd Magnetic Locator.